First, there were the seven words you couldn't say on television, as famously codified by George Carlin. For some time, the "N" word has rightfully been banished from public use, along with some other ethnically disparaging terms. Even if there is ambivalence in some areas of race relations, our collective sense of propriety at least expresses the direction we want to go as a society. Much of human speech is devoted not to communication as much as it is to obfuscation. "Look me up when you're in town." We really ought to do lunch sometime." "The check is in the mail". Who does not roll their eyes at such worn out phrases? Politics is built upon deception. My father favoured a popular saying. "Diplomacy is the ability to tell a man to go to hell and make him look forward to the trip." Some of the worst places to live in the world are the "Democratic Republic the Congo, the People's Republic of China and the "Democratic People's Republic of Korea." The "Fairness Doctrine" is another example of controversial legislation sugar coated in the language of sacred truth. Debate about this subject is often preceded by a long preamble of cutting through obfuscation and outright deception. The latest word that I believe should be banished from political discourse is "distraction." It was used by an attorney general named Jennifer Joyce in Missouri during the Obama campaign. She repeatedly stated in a television interview that voters don't want to be "distracted" with irrelevant issues during a campaign. Today, Mike Bloomberg refused to join a mayoral debate until the major parties have nominated candidates. He is allegedly too busy running the city. I was listening to National Public Radio early this morning when I heard the "D" word. They were talking about Mayor Bloomberg ducking a debate with other candidates. No, the word is not "duck." The word used in the broadcast was "distraction." Mayor Bloomberg can march in parades, and go to street fairs, but a debate with two other mayoral aspirants is a "distraction." 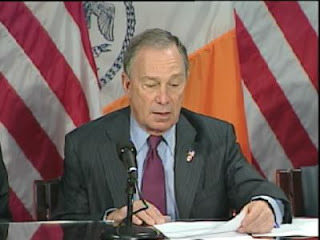 I do not for a moment think that Mayor Bloomberg would fare poorly in a debate. He is a clear thinker and an effective communicator. Like his predecessor, Rudi Giuliani, he sounds reassuring and authoritative in a crisis. He has enough achievements to look good on a resume. He is generous with donations to charity. So why is he ducking? I believe that Mike Bloomberg wants as little publicity as possible for his opponents. By refusing to appear with them, he is depriving them of a shared session with him in the spotlight. This is shrewd. It shows that Bloomberg has a keen understanding of the media off which he has made billions. But it is an injustice to the people of New York not to participate with his opponents in an airing of the issues. I see nothing wrong with a mayor enjoying himself at a street fair or sitting for a "fluff interview" with a journalist about his personal life. But this is not an adequate substitute for a rough and tumble debate with opponents who represent different philosophies of governance. Americans wish their leaders well on a personal level. That is why an article about the Obama's family life or Mayor Bloomberg's filial devotion warms the hearts of readers across the board. But such stories are not a substitute for meat and potato news coverage and political debate. When a leader tells the people that their questions are a "distraction"it can be perceived as arrogant. In some instances such as in Missouri, it sounded downright sinister when a law enforcement official presumed to set the parameters of political debate. We have a representative form of government. In the best of circumstances, reporters are a surrogate for the people, voicing concerns and asking questions on their behalf. Additionally, it is important for sitting candidates to face their opponents in a public forum. This is not "distracting." This is educating the public far more than ribbon cutting and marching at parades. The word "distraction" is suitably used in a classroom full of fourth graders. It has no place in political discussion. It is insulting when used with people who are old enough to vote and care enough to do so. "Distraction" should join "politically correct" in being retired from the political lexicon. Both "p.c" and "distraction" should only be uttered with satirical derision on late night television. If the people think an issue or a debate is important, then it is.